Please note that there is no tuition for the program. If you are in need of assistance with the room and board cost, let us know by emailing Connie Meadows in the Moderator’s Office. If you are interested in learning more and applying to participate in this retreat, please click here to complete the online application. Every year, The Office of Formation and Leadership Development (OFLD) receives clergy license fees in order to renew the licenses of our clergy in local communities. 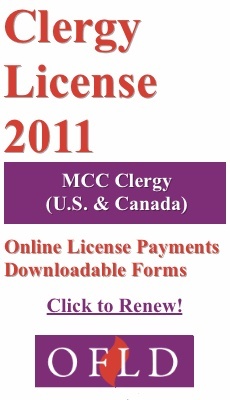 Clergy are responsible for completing the appropriate forms and paying yearly renewal fees. Click here for more information and to renew. On December 2, 2010 Frank Zerilli will retire from MCC staff after 36 years of distinguished service. Frank began working for Rev. Elder Troy Perry as his confidential assistant in 1974, and over the course of the years has worked with many of us throughout MCC and in other organizations around the world. Earlier this month, we had an opportunity to celebrate with Frank when Rev. Troy Perry visited Abilene to celebrate the 30th Anniversary of Exodus MCC. We reflected on the past 36 years and presented Frank with a plaque to commemorate the celebration. Rev. Elder Nancy Wilson, Moderator of MCC, recorded a special video message for the occasion. We invite you to click here and visit the web page we have set up for you to view the video message from Rev. Elder Nancy Wilson, see the photo from the retirement celebration event, and even post your own message of congratulations or share a favorite memory with Frank. We pray for bountiful blessings for Frank as he retires, and are grateful for his presence with us over the past years. As part of our ongoing financial management, we found it necessary to eliminate the staff positions held by Rev. 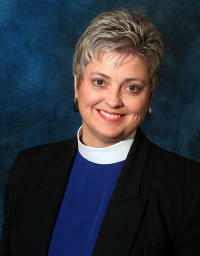 Dr. Sharon Bezner, Rev. Jennifer Glass, and Joshua Love. To each of them we extend our farewell wishes and note that their presence is already missed among our remaining staff. We see them blessed and loved as they prepare to engage the next opportunity that God holds for them. Regarding these difficult decisions, Rev. Elder Nancy Wilson says, “Sharon, Jen, and Joshua have all made significant contributions to the mission and ministry of MCC that is felt around the world, and we are so grateful for their service.” Please join us in holding each of them in our hearts and prayers. Well, that’s a question the Elders have been asking all year! And without a doubt, we have discovered that, SIZE has everything to do with how a church behaves, structures itself and commits itself to ongoing transformation. We are VERY pleased with the level of participation on the part of our churches and based on the feedback we have received, believe this is one of the best things that has ever been offered to our churches by the denomination. To date, 72 churches in the U.S. have participated in a Church Size Summit and a thorough assessment/feedback has been provided. We have held Church Size Summits in Austin, TX, Tampa, FL, San Francisco, CA, Kansas City, MO, Detroit, MI and Washington, D.C.
November 11-12, 2010, we will hold the final Size Summit for this year in Las Vegas, NV. To date, 9 churches have invited one of the Elders to come and do Mini-Size Summits for their congregations. A total of 374 individuals have attended Church Size Summits. The dynamics of Church Size DEFINITELY explain why our churches are, by in large, stuck and gives concrete strategies for changing our trajectory from flat to growing! Of the churches we have assessed, when churches have a Stewardship Program with 3 key elements present, their per capita giving (per person per week) is $38.11 and when those key elements are not present, the per capita giving is $18.68. Do the math!!!! Of the six key functions of the church, the amount and quality of programming and required staffing are the two areas where our churches have the greatest challenges. The collective Congregational Surveys that are part of the assessment process show clearly that our congregants are hungry for spiritual growth but perceive that our churches do not make it a priority. The role of the pastor, depending on size, changes so we must do a better job of matching the gifts and skill of the pastor with the appropriate size church. 3. Work with The Fellowship to determine how Church Size Summits might be helpful to them if made culturally relevant. 4. Begin a new series of Summits that serve to offer crucial follow up information and experiences to the Size Summits. According to Arlin Routhage, “Size is the most obvious factor affecting congregational life!” Please include attendance at one or more of the summits as you do your planning for 2011!